Emergency personnel investigate the scene in Van Nuys, where a small plane crashed into a building on Tuesday, Aug. 2, 2016. 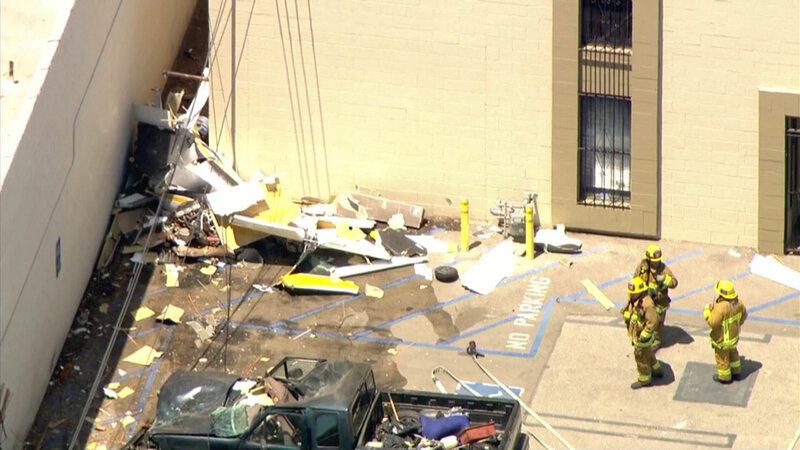 LOS ANGELES -- One person was killed when a small plane crashed into a building near the Van Nuys Airport on Tuesday, according to officials. Authorities said the plane crashed into a building located in the 16100 block of West Hart Street at about 1:30 p.m.
Only one person was on board the plane and was pronounced dead at the scene, according to the Los Angeles City Fire Department. Officials said power lines were also knocked down during the crash. There was no fuel leak, according to authorities.